One way you can be pretty sure that I am a liberal in American political terms is that I really don’t mind taxes. I frame this sentiment in two ways. First, I happen to have empathy for my fellow human beings and I am totally cool with redistributing a pretty big sum of my meagre wealth to other people if it serves the greater good. But, shhhh, be quiet about all that altruism. The second reason is why I really don’t mind taxes: I want stuff from my government. Roads? I like’em. Firefighters? Nifty. And for all the bitching that homeowners did in Drexel Hill about their property taxes, do you know how excited I was every time the dang snow plow would come down our dull little street before there was even an inch of snow on the ground? SO EXCITED! Because, after you have lived through a few blizzards in Philly proper, where your side street is left with six inches of hard-packed ice on the ground for a month after the snow, the sight of a snow plow before it’s even really necessary is really freaking exciting. New Zealand has an uncomplicated flat tax rate on income and in exchange for forking over so much of your hard-earned money the government actually cares about you while you live there. Yes, socialized medicine, they have that. But I’m talking about special perks like friendly and informative people working at the Ministry of Biosecurity who don’t mind talking to you on the phone. I’m talking about really well-designed government websites that thoroughly answer your questions about every possible municipal service. Look at them there, all lined up together, so stately and consistent with their thick yellow plastic lids. It was just such a service that brought me to said web site a few weeks ago. As a part of Wellington’s impeccably well-choreographed dance of weekly trash and recycling pickup, I noticed that some amount of neighbors had special wheelie bins for their recycling, while we were left with the still-pretty-cool color-coded bags that you buy at the library – a place where paper goods can also go to get re-used! Anyhow, putting recycling in a disposable plastic bag seemed to be a bit counter-intuitive and I covet pretty much any kind of functional houseware I can lay my hands on, so of course I wanted our own wheelie bin. They didn’t seem to be sold anywhere I could find, so I turned to internet research, which is actually effective in Wellington because all of their web properties are so lovely. The lovely government website provided a handy number to call for wheelie bin inquiries. The handy number was answered by a friendly human being with one of the thicker Wellingtonian accents I have encountered to date. Forging through this potential communication barrier, I explained how I coveted a wheelie bin. In return, the friendly government employee (paid for by our hard-earned tax dollars) explained that he would have someone visit our property to conduct a multi-point inspection for appropriateness of wheelie-bin issuance and we would be notified by post if we were approved. “Awesome,” I told him. I love tests. Bring on the inspection. Friends, yesterday I received a letter from our friendly, helpful government. Do you know what it said? WE HAVE BEEN DENIED A WHEELIE BIN. As you might expect, my initial reaction was to be at least 51% Philadelphia-style outraged. What did they mean denied? Hadn’t they noticed all of our other neighbors with bins? Did I have to take photos of every one of those bins and send them every hour on the hour to the friendly, heavily-accented man until he relented and reversed the decision about our property? Yet, if I was 51% outraged, I was also 49% bereft. This was one of those awesome government services I was excited to enjoy here. Do you know how hard it is to get your recycling bin replaced in Philadelphia? Actually, scratch that – do you know how hard it is to contest the ticket you are written after your neighbors muss up your recycling so that it’s uncollectible but it’s not your fault at all? I know. I remember. I was looking forward to living in a kinder, gentler, friendly, more service-oriented municipality, and the first thing they did was shatter my wheelie dreams. I had literally reached the point of stalking out of my house on recycling day with phone in hand to document all the neighbors who were unfairly flaunting their wheelie bins when I caught a hold of myself. Did I really want to bring this style of battery-throwing Philadelphia argumentativeness to Wellington? And, now that I was out on the street early on a Monday morning, wasn’t the inspection letter kind of right about how there was no safe space for a bin at the end of our drive? And wasn’t it awfully exposed to wind from all four sides, another disqualifying factor? And, come to think of it, wasn’t it the case that none of our immediate neighbors had their own bins, either? I slunk back into my house, my quest for vengeance against the wheelie bin appropriateness inspectors safely deflated. Being denied the wheelie bin was the whole point of being in such a cool place. They actually thought about if we ought to have a bin. Like, they didn’t just peek at Google Earth, they visited our house and gave it personal attention. Know how friendly and helpful everyone is here, they probably tried their darndest to find a spot where the bin could work. Would I rather the street be strewn with windswept bins and their various contents every week? No. On the list of stuff I hated about our last house, chasing our recycling down the block on a windy day was pretty high. 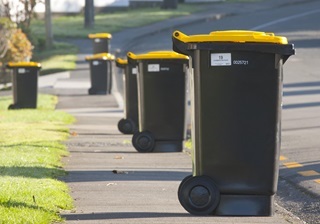 Thus, today I am feeling 99% resolved about our wheelie bin situation, and just 1% sad … because they seem like really well-made bins. But I’ve convinced myself that Wellington is much too clever to be creating tons of plastic bag waste with their recycling, so they must be managing those somehow. Plus, if I ever can’t fit a stack of cardboard boxes into one of the bags, the government website has a very informative section about bringing your own recycling to the dump. I am actually really excited to visit the dump.